In this article, we'll take a closer look at the operational and content delivery challenges facing media operations and offer some suggestions on workflow design, including deployment of end-to-end systems for streamlining content creation, access, archiving, and reuse for monetization. Today's content processes must meet the needs of a range of users with varying requirements, from editors and producers to senior management and social media/marketing staff. Add to that the decentralized nature of today's production teams, with edit, audio, fx, and composition professionals often working from disperse locations. Even if a file is online and accessible, a team's inability to gain a clear view of its location or status creates chaos and adds stress. And of course, there's never enough time - with delivery cycles constantly shrinking and demand growing for efficiency and immediate turnaround. In addition to working in a mixed environment of on-premise, cloud and hybrid systems and across the major platforms (OSX, Windows, and Linux), operators must juggle a plethora of codecs and containers, plus manage complex storage systems with combinations of fast-edit, slower online, LTO, cloud, and optical storage. Typically, storage is spread across the organization in disconnected silos and in many different types and configurations. Plus higher bit rates, 4K and 8K frame rates, and technologies such as high dynamic range (HDR) place a huge strain on storage resources. Searching for and managing video assets can be incredibly time-consuming, and up to a third of all searches fail entirely. Adding to the challenge are proprietary and opaque file formats that can't be previewed easily in the operating system. Given these challenges, how do media companies adopt new and better workflows for accessing and managing media assets? One of the keys, of course, is a set of robust tools that are not only easy to deploy and use, but reflect and automate their own specific processes. But first, you need to do a bit of soul-searching. Your organization needs to get as much clarity as possible on what its particular requirements are and what a tool or set of tools will bring to the table. What is your end-to-end cycle for content assets? From shoot, secure, and screen to search and re-use, how does your organization need to work with content throughout this cycle? And what are the component parts and the resources you already have in-house, such as cameras, storage systems, archives, and asset management tools? As you carefully design your workflow, it helps to draw it out and picture it visually. Plus to consider what are the people factors and organizational aspects. Do you need an in-house archivist? And what's the fine line between enforcing the workflow across a team and encouraging flexibility? How will you train your teams to get their maximum benefit from automated processes? The answers to all of these questions will inform your selection of a media asset management (MAM) tool. Essentially, MAM solutions track content and manage its movement between storage tiers as the content progresses through every stage of pre-production, production, and postproduction. Depending on the complexity of the organization, picking the right MAM tool also takes planning and research. We recommend considering the following factors when evaluating MAM solutions on the marketplace. Ease of Use. Many MAM solutions offer a large array of tools and robust functionality, but they can be difficult to learn, use, and manage - and they have a price tag to match. The best MAM solutions offer just the right balance of power and ease of use, with the flexibility to adapt to customers' workflows. Flexibility. Will the tool you deploy today be able to scale and adapt as your organization grows and changes? Will you be able to migrate your historic, manual workflows to the new automation system? Will the tool reflect and enforce your organization's own, specific requirements and work processes, or will you have to adapt the organization to the tool? Interoperability. No workflow operates in a vacuum, and neither should any tool for automating the workflow. Does the MAM solution work and play well with every other system in the workflow, cameras, storage, archives, networking, mobile devices, DRM, social media, and delivery platforms? Native Format Support. In a fast-paced, deadline-intensive production environment, the last thing people want is to have to take time out to transcode 50 hours of footage. 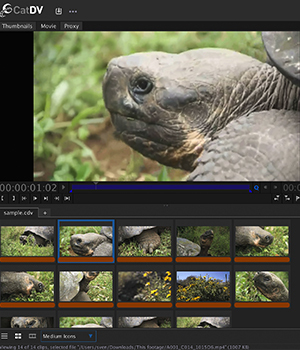 Therefore, the MAM tool should be able to ingest and play out files in their native format, including content from professional video and even DLSR cameras. When properly implemented, a MAM solution offers a true collaboration tool - empowering users from any location to view, share, and comment on the state of current assets such as dailies. Media organizations can save time and money by avoiding costly re-shoots and by re-using content, such as b-roll footage, in new productions, and they can even monetize the content for new revenue streams. By placing control of assets and their access in the hands of the content creators themselves, these tools offer a fundamental shift from traditional workflows in which production engineers would have configured and managed access to content. With a state-of-the-art MAM system, content creators have these same capabilities at their fingertips, in an easy-to-use package that saves time, lowers costs, and simplifies the access, re-use, and even monetization of valuable content assets.